Preview: The Cavaliers showed signs of improvement in 2014 opening the season 4-2 overall with solid wins against Louisville and Pittsburgh, but the team fell off winning just 1 out of their final 6 contests. The season may have been disappointing after the quality start, but this program is still building and heading in a positive direction under head coach Mike London. This could be the make or break year for London in the wide open ACC Coastal and in his first 5 years as the head man he’s led the team to a 23-38 overall record. The offense has claimed an identity and the team is happy to build around QB Matt Johns who showed potential in his time on the field behind Lambert in 2014. There was a QB competition in spring ball and with Lambert unable to separate himself from Johns he decided to transfer. 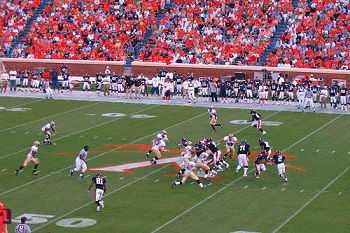 The Virginia O-line has been good in pass protection, but needs to do a better job of opening holes for the run game. The O-line returns 3 starters to a unit that is deep with experience. The run game underperformed last season and the team hopes for former top recruit RB Smoke Mizzell to have a breakout campaign. The receiving corps has experience and this unit will be led by Thorpe and Severin. The defense is likely to take a step back in 2015 with only 5 returning starters back in the fold. Virginia was hurt by guys like Harold and Valles leaving early for the NFL and this has the Cavaliers’ defensive front 7 in rebuild mode. The D-line was stout against the run a season ago and that can still be the case with 3 returning starters back. The D-line will be led by Moore, Dean, and Brown. The LB corps has to replace all three starters and this unit will be short on experienced depth. The strength of the defense could come from the secondary and this unit will build around talented players like Quin Blanding and Demetrious Nicholson. Prediction: Head coach Mike London remains on the hot seat, but at least he brings back a roster of players that can win games both in and out of conference play. Virginia probably has to make a bowl game to keep London around and that should be the goal for this squad. A brutally tough nonconference schedule could make this goal tough to attain as the Cavaliers have September contests against UCLA, Notre Dame, and Boise State.